Hubble, Bubbles, Toil and Trouble in Space! 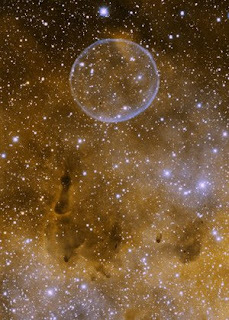 IT LOOKS like a soap bubble in space, but the image at right is a newly discovered planetary nebula. Planetary nebulae, which got their name after being misidentified by early astronomers, are formed when an ageing star weighing up to eight times the mass of the sun ejects its outer layers as clouds of luminous gas. Most are elliptical, double-lobed or cigar-shaped, evolving after stars eject gas from each pole. 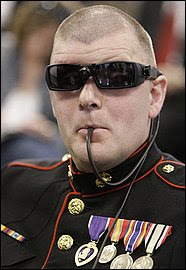 US Marine Cpl. Mike Jernigan blinded in Iraq, Begins to See VR. BUT... And YOU Know Me By NOW... 5 years on he been given a llipop kind-a-device, where he uses his tongue to stimulate his visual cortex and send sensory information to his brain?????? Called the intra-oral device, or IOD, the lollipop is an inch-square grid with 625 small round metal pieces. It is connected by a wire to a small camera mounted on a pair of sunglasses and to a hand-held controller about the size of a BlackBerry. The camera sends an image to the lollipop, which transmits a low-voltage pulse to Jernigan's tongue. With training, Cpl Jernigan has learned to translate that pulse into pictures. He can now identify the shapes of what is in front of him, even though both of his eyes have been removed.